If you have read the previous entries regarding ROASTING, and A ROAST FOR EVERY BEAN, you are aware of the delicate balance that happens within each bean as heat is applied. 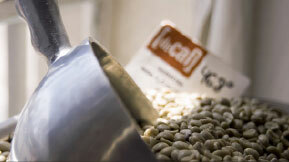 Once roasted, elements of the coffee beans that give it its superior flavor begin to break down. Within 72 hours the gasses, where most of the flavor is held, has significantly dissipated; and the delicate oils begin to be released from the beans. Believe it or not, many roasters who freshly roast their own beans let them sit for days before selling them, making them more bland, but more palatable to more people. Not unlike wine, each bean flavor, we believe, should be celebrated and consumed as-is. We respect our customers taste enough to believe that they want the full coffee flavor experience; not a beverage that is anything less than perfect. To prevent off-gassing and oil degradation we freeze our beans immediately after roasting. We sell them frozen, and we suggest you take them home and freeze them (in an air-tight container) as well. If beans are left out, please consume them and do not re-freeze; they will taste like whatever dominant flavors reside in your freezer. And please... take just the beans you need out of the freezer frozen, allow them to come to room temperature, then grind and brew (or make espresso). Pre-grinding your beans does not complement the coffee experience, and robs you of the extra two minutes in the morning when you can pause, reflect, and enjoy the amazing aroma of freshly ground beans.